2231 Platenstraße (click image to magnify. Military housing for families, pretty much as it was in the early 60s, except then the buildings were painted in solid pastel colors — yellow, green, etc (this was pink). My family lived in the apartment at the upper left. This housing area, like the others around here (Hügel, Drake-Edwards, Steuben, HiCog), had rows of long low-slung buildings like this (two or three stairwells, three or four floors, two apartments per floor per stairwell). Note the well-used balconies. A common custom was to find a distinctive fabric and weave it through the rails. In the stairwell, as in all German stairwells, the light stays on only for a minute — you have to push the (glowing) switch on each floor on your way up the steps. In the attic, each building had a cavernous "play room", either empty, or perhaps with a ping-pong table. In the winter you could have snowball fights across the parking area from balcony to balcony. Since the buildings were lined up so well, you could see through one building to the next, to the next, and so on for many buildings, if everybody had their curtains open. View from our apartment, about 1959, looking east along Platenstraße, showing the rows of lined-up apartment buildings. Click on image to magnify. View from our apartment, about 1960, looking north (click on image to magnify). Big gas-guzzling cars with tail fins* (Americans paid 10¢ a gallon for gas; Germans had to pay at least 10 or 20 times that, which is one reason why there were so many bicycles, Vespas, Isettas, Messerschmitts, and Goggomobiles on the road). At the end of the parking area, turn left to go to school. Just out of sight around the corner is the baseball field where the Vikings played, which was also a shortcut to school. Btw, if you don't know about Messerschmitt, Heinkel, and other "microcars" of the 1940s and 50s, READ THIS. In the postwar years, few Germans could afford normal automobiles (Opel, Taunus, Borgward, NSU, VW, let alone Mercedes). These tiny one- or two-seaters — some of them made from World War II fighter cockpits — got people on the road and helped bootstrap the Wirtschaftswunder. All American buildings, including these, were turned over to Germany in 1995. 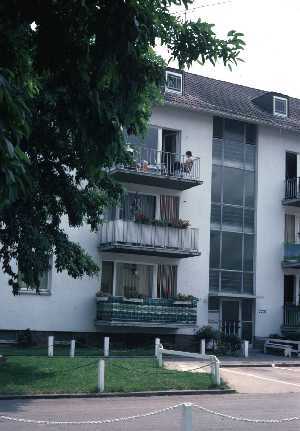 Platenstraße and the other housing areas now house mainly "Gastarbeiter". When I lived there in the 1950s and 60s, there were not so many Gastarbeiter. Most of them (Greeks and Turks) were in Höchst at the big chemical works. They lived in huge barracks and weren't allowed to go out into the town. Many of them got sick from the bad air. Frankfurt was cleaner than Höchst, with nice parks (like Grüneburg Park near the high school). In those days, you could see rabbits running around the city! (*) That's our car at lower right — a Studebaker!